Made in a DK weight (8ply) yarn, this cute little stuffed toy knits up really quickly. The head and body is made in one piece, so the only seaming is for the legs. All pieces are worked in the round. This pattern includes pattern pieces for felt cut outs for the facial features as well as feet bases if you wish to have a standing plush. 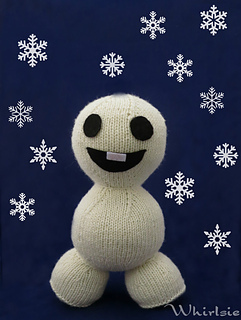 Beware that the children in your life will claim these cute mini snowmen for themselves, you will end up making more and more! Please note you will also need a small amount of felt for the facial features and stuffing for the body.